Happy Halloween Sale at Stamp and Create! Second of Two Card Monday! 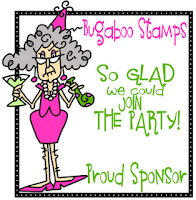 Stamp and Create Product Spotlight SUMMER! We want to you use something that you haven't used before on your projects this time...it can be something you've been saving for a special card...you know...only taking it out occasionally to admire/stroke...or something you've just bought...there are lots of lovely new Christmas collections being released at the moment...or maybe there's something in your stash that you have for absolutely ages but have never got around to using...now is your chance! The prize is a $15 gift certificate to spend in the amazing Simon Says Stamp store! And...if that's not enough...we are excited to welcome a new sponsor to our challenges...Bugaboo Stamps! 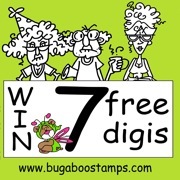 The prize from Bugaboo Stamps is 7 free digis of the winner's choice...wowee!!! Here is a picture of my unused stash. 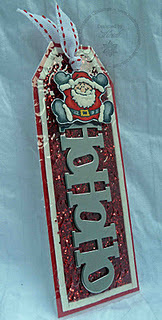 It's a metal gift tag I found in one of the Michael's Dollar bins, but I got it for $0.30 I think! Gorgeous tag Heidi!! Love the colors! This is so festive. Love it! Brilliant tag, Heidi. Lovely little Santa. Can't belive how much unused(and beautiful)stuf we all have. I love this!! Such a cute tag! !